Map courtesy of Southern Star Central Gas Pipeline Inc.
Southern Star Central Gas Pipeline Inc. (Southern Star) has filed an application with the US Federal Energy Regulatory Commission (FERC) for the Blackwell Redundant Compression Project. 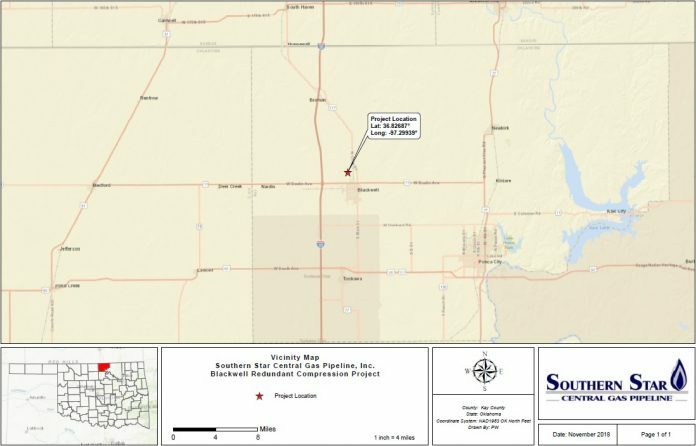 Located in Kay County, Oklahoma, USA, the project will involve the installation of one gas-fired compressor unit and other appurtenant and ancillary facilities at Southern Star’s existing Blackwell Compressor Station. The Blackwell Compressor Station is a major throughput station, and as a result, temporary shut-downs associated with routine maintenance activities impact service to Southern Star’s existing customers. Southern Star is proposing to install a new compressor unit capable of providing redundant compression at the Blackwell Compressor Station. By providing redundant compression, the new unit would prevent future customer impacts along Southern Star’s system should one of the four existing compressor units at the Blackwell Compressor Station be taken offline for routine maintenance activities. Additionally, the new gas-fired turbine would generate adequate compression so that either the two existing GMVH-12 compressor units or the two existing GMVC-10 units could be placed on standby during normal operations; thereby improving the station’s overall flexibility and efficiency. Southern Star proposes to install a Solar Modular Turbine compressor package at the existing Blackwell Compressor Station. The new compressor package will consist of one 6274-hp (4680 kW) Centaur 50-6200LS unit as well as a discharge gas cooler, pipe valve skid, local equipment room building, air compressor building, and valves for pressure control. In addition, Southern Star also proposes to extend two of the existing station’s main gas suction header pipelines and a discharge header pipeline to service the new compressor unit. Common filter separators will be installed on both the existing 26-in. (660-mm) diameter Line N suction line and on the existing 20-in. (508-mm) diameter Line V pipeline. The Blackwell Compressor Station is Southern Star’s sixth largest transmission compressor station, currently utilizing four units totaling 8400 hp (6266 kW). In addition to its nine underground storage compressor stations, Southern Star operates 32 transmission compressor stations as part of its interstate pipeline system.